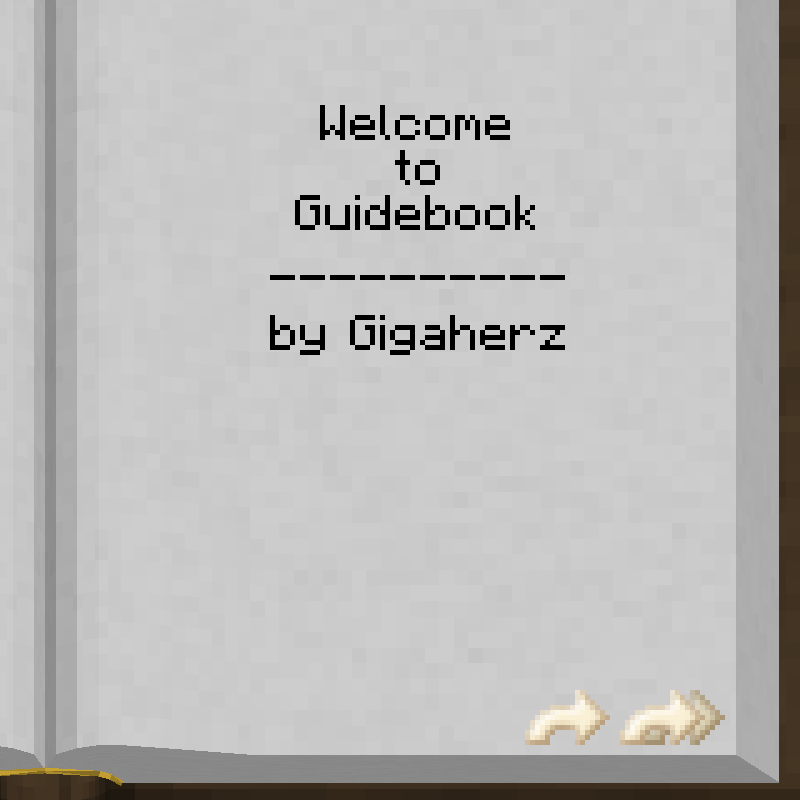 Guidebook is a library/mod that adds customizable books. You can add books through mods, resource packs, or using the configuration folder. If you used the mod for your mod's documentation or a modpack / adventure map, and want it mentioned here, feel free to tell me and I'll be glad to check it out! Visit the wiki pages for detailed explanation about the XML file structure and where to place the files. Hyperlinks: navigate within the book, open web URLs, or copy text to the clipboard. The ability to bind links to commandblock commands. The ability to listen for link clicks, and handle them from other mods. Quest-tracking features and achievement display. Feel free to suggest more features! How to include a custom template/library file? In .../config/books I have two files, a book.xml and a mystandard.xml. But how to include my library file? This is now fixed in my local copy, next release will properly load libraries from the config folder. is it posible to make a image clickable like an link? Hmpf. It's supposed to, I'll have to look into it. it would be nice if this would be implemented. thnk you very much. It is already implemented in my working copy. Next release (soon, I have some glitches to debug), will include images in links. I'm running a survival server to play with my friends, and we use many mods. so I want to make the guidebook for harvestcraft craftable for my friends. Can I add a custom guidebook recipe?? If I can, how can i add it? Help me understand what you want. I've been getting better at making guides with recipes, and if you tell me some mods you want to use, I can work on making guides for those (and show you the files in progress, to help you learn how to make them). I haven't found an existing guide for HarvestCraft. There's a wiki that lists items, but I'm not sure about recipes. I would like to put at least some of the recipes in a book that you can read in the game. When you want to make something, you would pick up the book and turn to the page that has the recipe you want to make. I made books like this for StorageDrawers and TheCampingMod. I'm working on books for IndustrialCraft2 and BiblioCraft. The first 3 items are in the top row of the crafting table, the next 3 in the middle row, the next 3 in the bottom row, and the last item is the result of the crafting process. I can use this template to show recipes from most mods. If I know the mod id and the item name, I can show its recipe in my guidebook. But this is not about making new recipes. Do you want to make a custom book for recipes that already exist for game items? Or make a new custom recipe for game items? Can I add a custom book cover image? Like, blue book cover, not the original brown book cover one?? I have considered it, but it would be a bit complicated to implement. My best idea was to make the cover image gray, and apply a custom book-provided tint, with the brown being the default. Someday I'll get around to it. What's the difference between <section> and <page>? I've used both but with strange text-overflow issues. Yes. Page was the original, before automatic pagination was present. I kept it for backward compatibility. That said, I can't get any png other than my cover file to load. I'll post if I learn why.